With professional gaming becoming more and more popular seemingly with each passing month, one game has stuck around in the cultural consciousness for longer than most others. Counter-Strike: Global Offensive is a phenomenon that will not let up, and its status as a professional gaming powerhouse remains uncontested. The stable of professional gamers focusing their efforts on CS:GO is becoming bigger and more diverse as the game maintains its popularity. For this reason, finding a way to get ahead can be important. One such way is via Benjamin Sufiani’s app CSGO SKILLS. 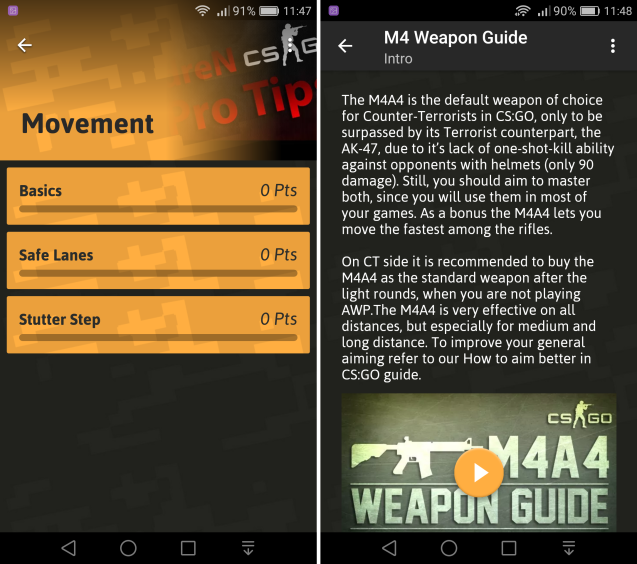 CSGO SKILLS is a free app dedicated to in-depth training on different aspects of CS:GO gameplay and strategy. Distinguished by the star on its app icon, CSGO SKILLS was first released in early 2015, and has received regular update since. CSGO SKILLS takes a four-pronged approach to bettering the players who use it. These four pillars are Free Practice, Weapon Guides, Map Guides and Training Plan. The Free Practice section of CSGO SKILLS is exactly like it sounds. These sections allow you to put in some practice time, free of charge, to better their skills in three specific areas. Movement teaches the basics of, well, movement. The subsections here are Basics, Safe Lanes and Stutter Step. The Basics help with crosshairs movement and strategies, a topic many new players may not even realize is significant among the CS:GO elite. The Safe Lanes training shows the best routes through each map location, important knowledge for building strategy. Stutter Step is a very specific and essential skill in CS:GO that involves strafing back and forth while firing at the exact moment you begin moving in the other direction. This skill can be ridiculously difficult to master, but knowing how to perform it means you’ll be able to fire while evading opponents. The window in which you’ll be able to hit your opponents is tiny, but practice makes it perfect. CSGO SKILLS gets a little more specific in this category, which focuses on the ins and outs of aiming in CS:GO. Like the Free Practice section, Aiming is set up in three different subsections: Basics, Recoiling and Prefiring. Again, the Basics are an introduction to aiming techniques in CS:GO. The app directs players to a popular practice map that hones aiming skills using red dots for the player to aim at and shoot. Recoiling is a section that familiarizes players with the different levels of recoil attached to the weapons available to use in CS:GO. Often referred to as spray patterns, this knowledge is important because it teaches players where a gun will actually hit when you pull the virtual trigger, making it essential for obvious. The final subsection of “Aiming” is the Prefiring section. Prefiring simply involves firing before you emerge from hiding. This strategy may waste a little ammunition here and there, but it also brings your reaction time down to the point that it becomes nearly impossible for an opponent to react quickly enough to avoid or stave off the attack. This integral skill highlights the importance of knowing CS:GO’s maps so you can prefire into hiding spots and gain a major advantage over concealed opponents. The next major section of CSGO SKILLS involves weapons guides for each major weapon in CS:GO. These weapons include the AK-47, AWP, M4, SSG08, FAMAS, P90 and Galil. In addition to an introduction, each weapon includes a subsection detailing shooting techniques, spray patterns, recoil compensation, specifications and a section in which players in training can watch the professionals using these weapons and techniques. The map guide is the most in-progress/under-construction feature of the CSGO SKILLS app. It features in-depth guides for Dust2 and Mirage, the former featuring the map’s info and history as well as sections featuring information on bomb sites, scanning and clearing, sniping and counter-sniping, grenades, call-out spots and more coming soon. The Mirage guide features an introduction and history, bomb sites and map knowledge, grenades, flashes and molotovs, and playing and holding the middle. Finally, the Training Plan section allows players to track their practice in rounds against bots while honing their skills in areas such as aiming, prefiring and movement. 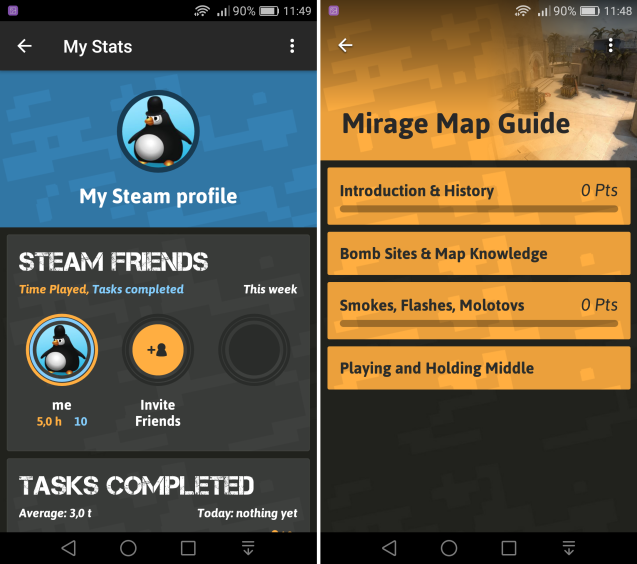 This goes along with the offerings throughout the rest of the app, specifically in other subsections, allowing users to start a timer to track their own progress in each individual skill training offered throughout CSGO SKILLS. Additionally, SKILLS gives players the chance to spread the word about the app and to tweak their reminder settings in the Settings menu. Bugs and feedback can be reported via the app. When it comes to enhancing and augmenting your skills as a CS:GO player, apps like CSGO SKILLS can be a very useful tool. Getting better and more competitive is the name of the game, and CSGO SKILLS has a sleek design to go along with the content it provides. 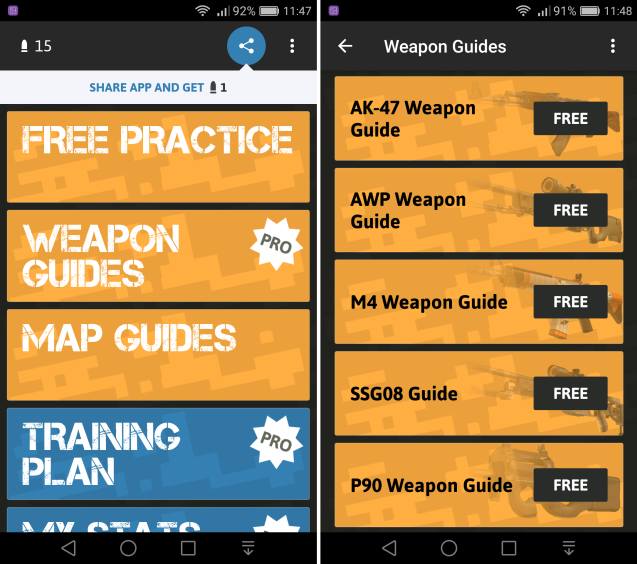 Find out more about CSGO Skills on App Store or Google Play. Happy training! © 2016 - 2019 CS:GO Pedia, all rights reserved. Created by k1nd3r & eZstah.